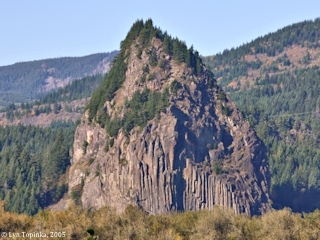 Click image to enlarge Pierce Island and Woodard Creek (Woodward Creek), Washington, with Warrendale, Oregon. 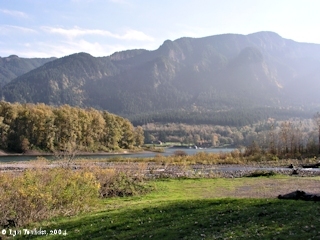 Pierce Island (left), Woodard Creek (running through lower middle ground), the Columbia River (left to center) with Warrendale, Oregon, in the background. 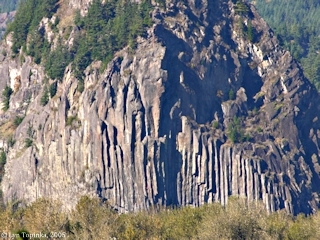 View from boat launch at Beacon Rock State Park, Washington, off of Washington State Highway 14. Image taken October 27, 2004. 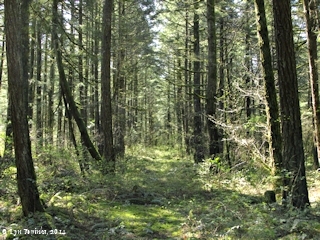 Warrendale, Oregon, is located on the south side of the Columbia River at River Mile (RM) 141.5. The neighbor town of Dodson is just downstream. Upstream is the mouth of McCord Creek and the John B. Yeon State Park. 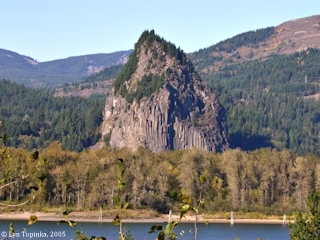 Across from Warrendale is Beacon Rock and Pierce Island. 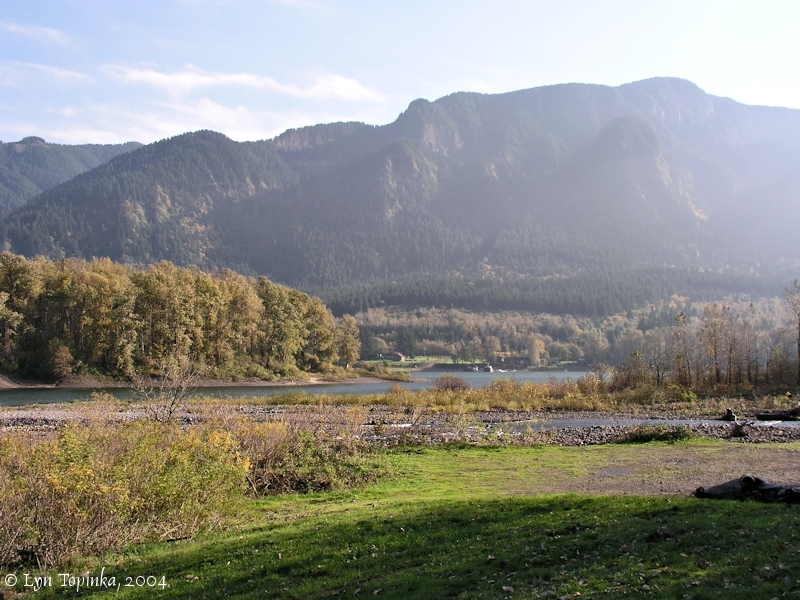 Warrendale was named after Frank M. Warren, Sr., a major figure in the Columbia River salmon industry. At one time Warren's fishwheels dotted the Columbia River. Warrendale was home to a cannery. Frank Warren died in the sinking of the Titanic in April 1912. His wife survived. The Warrendale Post Office served the area west of the Bonneville Dam between September 1894 and June 1942. A railroad station was established in 1916. Today the community is private homes. Great views of Beacon Rock can be seen from roadsides in the area, as well as views of Pierce and Ives Islands. "... At the village of WARRENDALE, (14 pop.) are the North American Fox Farms. When litters exceed the average of from three to five, the little foxes here are frequently nursed by house cats. ..."
Columbia Beach is a stretch of beach which lies between Dodson and Warrendale. The Columbia Beach Hotel was once operated by the parents of early Gorge photographer Fred A. Kiser. "Monday night United States Marshal Grady received a telegram from Prosecuting Attorney G.W. Stapleton, of Skamania county, Washington, who was stopping at Columbia beach, Or., near Dodson's, on the Columbia river, stating that there were two counterfeiters there. Marshal Grady wired him to get further information, and last night Deputy Marshal Beatie started out on the 6:30 train for the purpose of capturing the men. Before reaching Mosier he was met by Joshua J. Love, who was also tracing them. They kept their eyes open at each station because it had been learned that they were to board the train somewhere. Their efforts were soon rewarded. At Mosier two men took the train ..."
Source: "The Dalles Daily Chronicle", August 10, 1893, Historic Oregon Newspapers Archive, University of Oregon Libraries, 2015. 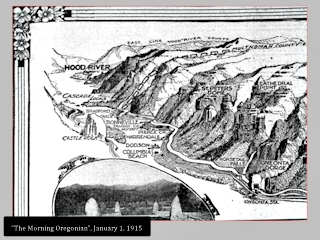 Click image to enlarge Detail, NEWSPAPER map/sketch, Columbia Gorge, "Morning Oregonian", January 1, 1915. The "Morning Oregonian", January 1, 1915, courtesy Historic Oregon Newspaper Archives, University of Oregon Libraries website, 2015. 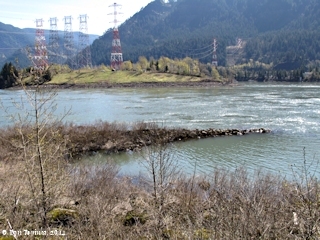 Columbia Beach is shown downstream of Warrendale and Dodson. 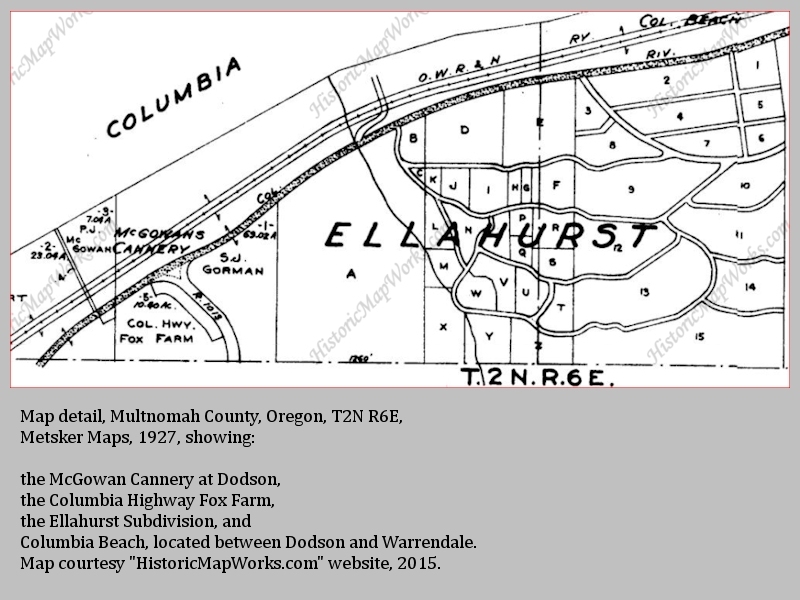 Click image to enlarge Detail, Multnomah County, T2N R6E, Dodson to Warrendale, Metsker Maps, 1927. Courtesy "HistoricMapWorks.com" website, 2015. 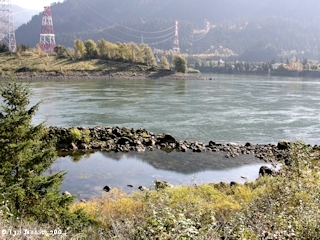 Columbia Beach is shown upstream of Dodson (McGowan's Cannery) and downstream of Warrendale (which is not depicted on the map). 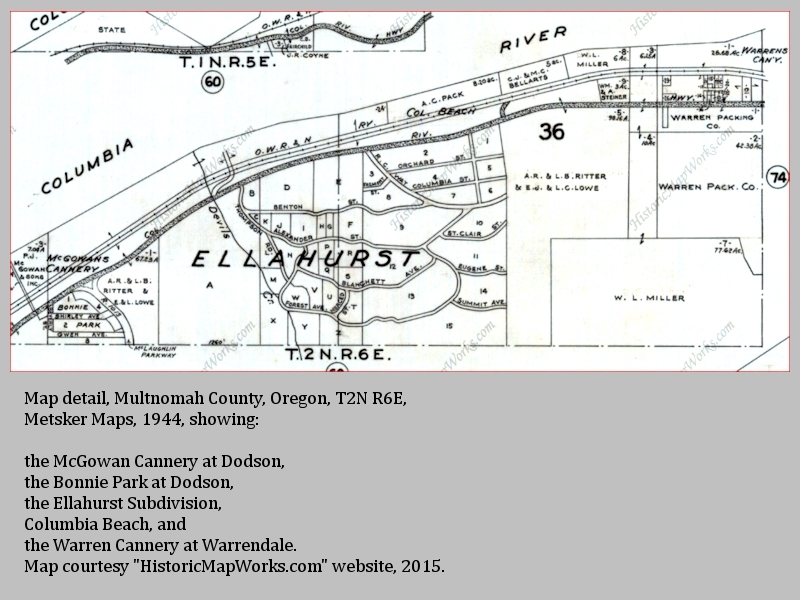 Click image to enlarge Detail, Multnomah County, T2N R6E, Dodson to Warrendale, Metsker Maps, 1944. Courtesy "HistoricMapWorks.com" website, 2015. Columbia Beach is shown upstream of Dodson (McGowan's Cannery) and downstream of Warrendale (Warren's Cannery). "Fred [H.] Kiser entered the photographic business around 1902 with his brother, Oscar, as Kiser Brothers Scenic Photographer. 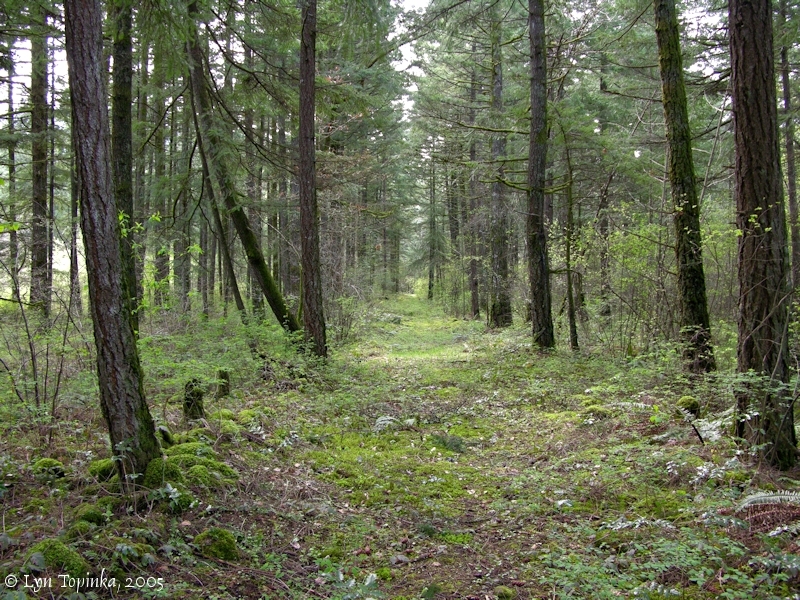 With studios both in Portland and at Warrendale, Oregon, they established themselves as significant landscape photographers. 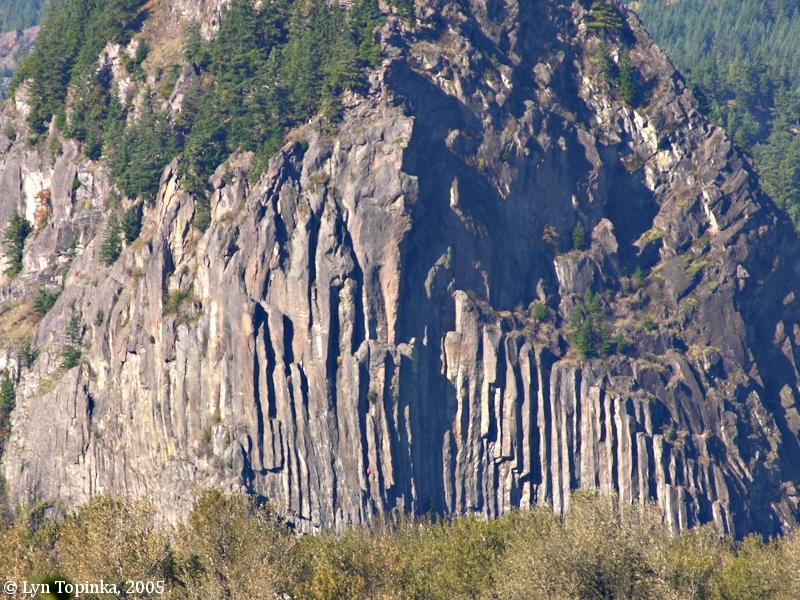 Their early images of the Columbia Gorge, some of which were hand-colored, played an important role in their rapid success. By 1905, Oscar Kiser was no longer associated with the business and Fred had been named official photographer for the Lewis and Clark Exposition. 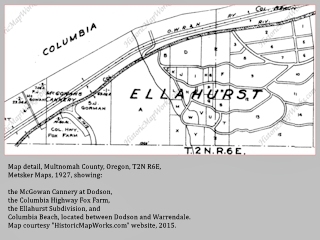 ..."
Source: Sue Sely, Oregon Historical Society, downloaded July 2015. 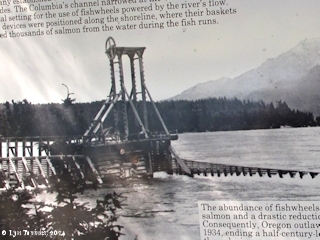 By 1881, thirty-five salmon canneries had been established on the Columbia River. Two were in the Dodson and Warrendale area of the Columbia River. 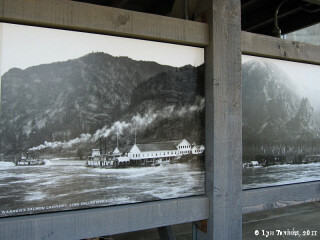 The Dodson cannery was built by Patrick J. McGowen and the Warrendale cannery was built by Frank Warren, owner of a major cannery located in Cathlamet, Washington. .
An early photograph of the Warren Cannery with two steamships docking at the cannery docks (the "Dalles City" and the "Tahoma") can be seen at the Columbia Gorge Interpretive Center museum in Stevenson, Washington. 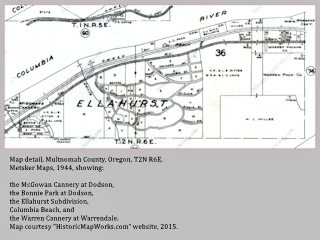 Click image to enlarge Exhibit, Warren Salmon Cannery, Warrendale, Oregon, Columbia Gorge Interpretive Center, Stevenson, Washington. Image shows two steamships, the "Dalles City" and the "Tahoma" docking at the Warren Cannery docks. Image taken July 15, 2011. 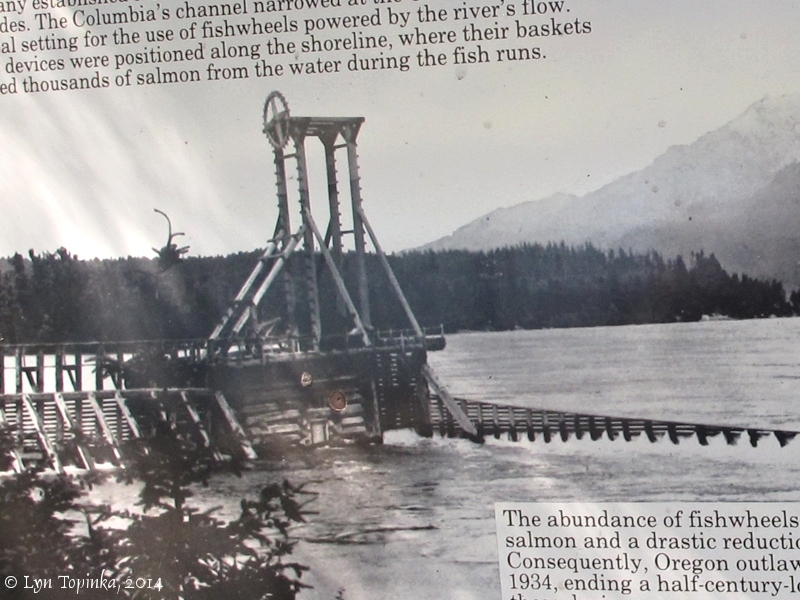 From the 1880s to the 1930s, fishwheels were used along the Columbia River to harvest salmon as they migrated upstream. In 1894 Frank Warren constructed Fishwheel No.3 at this spot upstream from Fort Cascades. The line of rocks served to lead the salmon into log cribs from which the wheel scooped the fish. The salmon were then shipped several miles downstream to be processed at a cannery in Warrendale. Fishwheels were outlawed in 1934 in the state of Washington. The Warren Fishwheel No.3 was located along the shore of Hamilton Island, upstream of Fort Cascades. 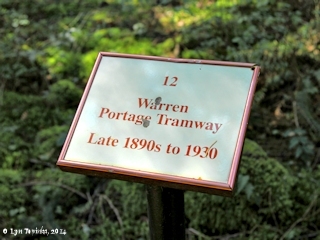 The "Warren Portage Tramway" was located on Hamilton Island. This tramway was used by the Warren Packing Company to transport fish caught in Frank Warren's fishwheel on Hamilton Island, down to the Lower Landing of the town of Cascades, and from there transported across the Columbia to the cannery at Warrendale. The tramway was built in the 1890s and operated until 1930. 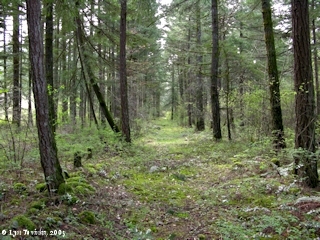 Remnants of the tramway path are now located within the Fort Cascades Historic Site.